The Internet has become one of the basic necessities of everyday life and market is flooded with companies that manufacture routers that promise to provide fastest and reliable internet connectivity. The best routers would be able to provide uninterrupted streaming, gaming as well affordability at the same time. Many new features such as multi-user connectivity, private VPN as well as customizable bandwidth allocation and dashboards are introduced each year by router manufacturers as there is a lot of competition in the market. Tp-Link ac2300 Wireless boosts powerful and ultra-fast Wifi that lets you play games and watch 4k videos. Its personal VPN server lets you access and surf browser without the expense of paid VPN subscription. Far-reaching and efficient wiFi with RangeBoot ability detects and receives WiFi signals from far located devices and equally distributes the airtime between near and far away devices. Providing non-stop streaming and gaming Tp-Link ac2300 Wireless comes at a price of $139.00 along with the two-year warranty. TP-Link Archer A5400 v2lets you play 4k videos and play games at the same time with its ultra-fast Wave 2 MIMO Wifi. Wifi Speed is up to 5400 Mbps and two 5Ghz bands using NitroQAM technology. TP-Link Archer A5400 v2also comes with an anti-virus that is able to provide protection, security as well as parental control to each device connected over the network. It also provides personal VPN server without the need to pay for VPN subscription making it one of the top and best routers in the market. Providing smart router and a two-year warranty, TP-Link Archer A5400 v2is priced at $249.50. Netgear Orbi Pro provides tri-band WiFi and ensures maximum speed throughout the house or business with MU-Mimo. It is and very secure and easy to set up with existing internet service. You could also dedicate protocols for a different type of users such as Guest, Customer or Employee. Netgear Orbi Pro could connect up to 80 devices at one time. It does not require wires to set up and you could place it anywhere and just enjoy the internet with same high speed. Netgear Orbi Pro is priced at $346.28. TP Link N300is ideal for video gaming, multi-tasking, and streaming thanks to its speed of up to 300 Mbps. The two antennas are 5dBi that helps in increasing the speed and stability of the network. TP-Link N300 is quite easy to setup and install. Feature control such as employee as well as parental could also be programmed to manage the network. Bandwidth allowed to each PC could also be customized by the administrator and this feature makes TP-Link N300 one of the best routers. 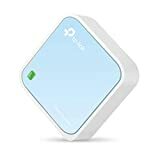 Connecting wired devices using Ethernet ports, TP-Link N300 is priced at $14.99. Netgear Night Hawk Pro gaming XR500fixes the lag in gaming due to the limited distance by providing Geo Filter and guaranteed local connection. You could also create blacklists and whitelists of server and prioritize gaming devices as well as allocate bandwidth to devices. The dashboard of Netgear Night Hawk Pro gaming XR500could also be personalized to view real-time bandwidth usage by devices as well as pinging delays on screen. Gaming VPN, Network monitor as well as dual-band Wireless Router make Netgear Hawk one of the best router that came out recently in the market. Netgear Night Hawk Pro is priced at $243.94. Linksys WRT32xb WiFi Gaming Router is engineered for Xbox gaming and identifies, prioritize as well as speed up gaming network. Fast 1.8 GHz dual-core processor ensures simultaneous high-speed data processing. It also provides about 65% reduction in peak ping on X-box for fast response time. You could also control traffic using customizable gaming user interface. Linksys WRT32xb Wifi Gaming Router is priced at $238.99. TP-Link AC 1200supports next generation of WiFi and is one of the most trusted & the best routers available in the market. It comes with simultaneous dual-band network of 2.4 GHz and 5GHz. It’s too external dual-band antennas provide fast and reliable wireless performance even at great distance. The network is easy to manage with TP-Link tether app. Providing smoothest HD streaming, TP-Link AC 1200is priced at $56.99. D-Link AC 1200 comes with a dual band that lets you play games at one band and stream media on another simultaneously. 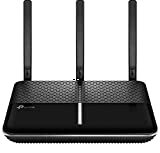 Its high gain antennas provide wide coverage throughout the house and its Gigabit ports could connect up to 4 devices at the same time. D-Link AC 1200 comes with fast HD and 3D speed and Multi-User streaming technology that lets multiple users stream on multiple devices. It also supports secure wireless Encryption on WPA and WPA2 and is priced at $59.99. 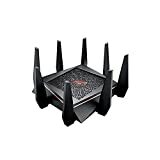 Asus ROG Rapture GT-AC5300 is tri-band wireless router that comes with multiple user connectivity for streaming as well as playing games. Its Quad-core processor is 1.8 GHz 64bit that maximizes data throughput from 8-ports as well as dual USB 3.0. VPN fusion lets user to run VPN and internet connection at same time. Game IPS protects the network from external attacks and threats. Asus ROG Rapture GT-AC5300is also equipped with ROG game Dashboard that gives access to features such as Game Boost, IPS and VPN Fusion. Asus ROG Rapture GT-AC5300 is priced at $314.04. Netgear Nighthawk X10 AD7200 is one the fastest and best routers for streaming online with its Plex media player. Its fast wireless Wifi technology provides smooth 4k video streaming, gaming as well as downloading. 1.7 GHz Quad-core processor and Quad-stream architecture of Netgear Nighthawk X10 AD7200 is powerful and provides combined speed of 7.2Gpbs. 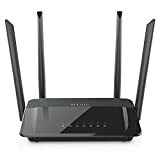 Providing multiple user connectivity, Netgear Nighthawk is priced at $449.99. Investing in a router is investing in all your online presence, streaming as well as gaming. A fast speed router with multiple device connectivity is a must-have for each household as well as business and a bad router is a nightmare. While many router manufacturing companies promise fastest speed, it’s always a good idea to take in account affordability and reliability.